Sounds lovely! I’m lucky enough to have a good grocery store within walking distance of my home, but there are a lot of areas in my city that have no access to affordable groceries of any kind. Yes, it’s definitely an addition for this part of the city. The west side has had good fruit and vegetable markets for decades. This opening will be rivaled only by Whole foods opening on 57th. Both saving us the crosstown schlep to Fairway. Hi Peggy, It’s all good, I suppose. 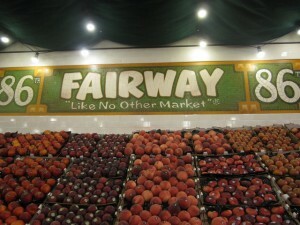 But I have a strong preference for Fairway, mainly because they offer so much high-quality produce and hard-to-find ingredients. I find the WF scene gimicky and their selections over-priced.